Today I have a fun little recipe booklet for y'all. A couple weeks back I received a copy of "Warm Up your Winter" by Laura Powell. Laura is a good friend of mine, so I was delighted to have the opportunity to hop on her blog tour and review her latest mini cookbook. 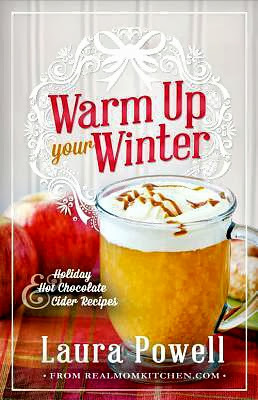 Warm up Your Winter is a 26 page collection of delightful Hot Chocolate and Cider Recipes to warm up your holiday. The weather here in North Texas is still pretty warm, but that doesn't stop me from enjoying my favorite hot drinks. In the morning I have coffee, but when the evening rolls around I turn to to hot tea or hot cocoa to complete my night. It doesn't matter what time of year it is I just love something hot before bedtime. Warm up Your Winter is a mini cookbook filled with recipes like, Rich & Decadent Hot Chocolate, Frozen Hot Chocolate, Salted Caramel Hot Chocolate, Pumpkin Pie White Hot Chocolate, Hot Vanilla, Hot Caramel Apple Cider, and my new favorite Nutella Hot Chocolate pictured below. 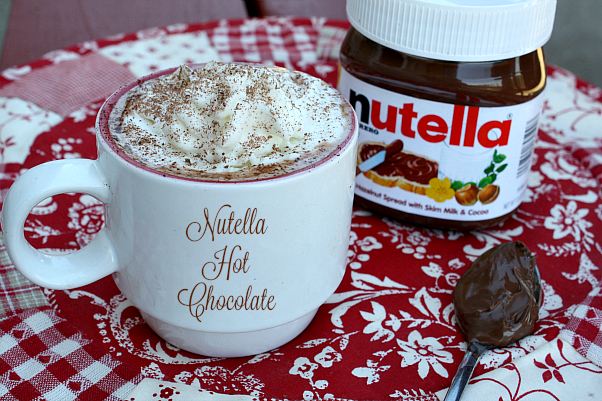 Nutella hot chocolate is made with a chocolate hazelnut spread. This recipe is really easy to make and only r equires two ingredients (milk & Nutella). If you are a Nutella lover this is a must try recipe. Next on my to make list to make is the Frozen Hot Chocolate which is a frozen treat of your favorite classic hot chocolate. My kids will love that one. I also plan on taking Laura's advice on making a Hot Cocoa Bar over the holidays with a few of the basic hot cocoas and adding an assortment of toppings. I have a triple bowl crock pot that would work perfectly. A hot cocoa bar is perfect for the up coming holidays when your house is filled with family and guests. If you would like to find out more information about Laura Powell visit her blog, Real Mom Kitchen. You can also purchase Laura's latest cookbook on Amazon for $2.99 or go to Laura's blog for other places it can be purchased. In a medium saucepan over medium low heat, whisk together milk and Nutella until the Nutella is dissolved and the milk is heated through. Serve in mugs and top with marshmallows or whipped cream sprinkled with chocolate shavings. Cooks Note: This can be made ahead of time, cooled and stored in the refrigerator. Reheat on the stove or in the microwave in individual mugs. To microwave reheat each cup for 1 minute. I love hot chocolate with lots of mini marshmallows and a single Andes mint candy melted in it. YUMMY! My favorite hot drink is Chai Latte! I make it at home from scratch and it is to die for! My favorite hot beverage is Hot Apple Cider. The Hot Nutella sounds really good. Will have to try it in a little while. Thanks! Hot chocolate all the wsy! I love hot chocolate and a good movie. Its the only thing that can replace my hot coffee. I love hot chocolate. Peppermint Hot chocolate is my favorite! So excited to try this recipe for the Nutella hot chocolate..with 2 boys who are huge Nutella fans I know it will be a hit. My favorite is tea; can't start my morning without it. However, we drink lots of hot chocolate in the winter. Nutella is a favorite. I love hot apple cider with cinnamon whiskey. Perfect way to end a fall day. My favorite hot drink is Hot Chocolate with Marshmallows. I love Starbucks' Pumpkin Spice Latte! cafe mocha for me....morning and night!!! White Chocolate Mocha from Starbucks! Normally hot chocolate is the easy one but a good mulled cider/cranberry juice or mulled wine is a nice thing too. They just aren't the norm. My FAVORITE hot drink is my grandmas canned tomato juice. It is sooooo good when it is cold and windy outside. Heat it up until you see steam coming off of the top. Sprinkle a couple of shakes of salt and enjoy!@! Hot chocolate or tea are my favorites! I love hot chocolate on cold days and curl up with a good book and a blanket. So warm and cozy!! Equal Exchange Organic Hot Cocoa has been my favorite for a few years now, but this sounds absolutely fantastic! I love hot chocolate with whipped cream. I'm like you and love a hot drink before bedtime. I have a recipe for an instant spice chai. It is the best! I am a hot chocolate lover too, and would love to have that book. I love hot chocolate with a spoonful of vanilla ice cream. It makes is rich and creamy. Give it a try! My favorite hot beverage is Apple Cider with Lemon Tea. I love mint hot cocoa. My favorite has been Hot chocolate with a dash of Kaulua in the cold winter. My favorite hot beverage is mulled wine! I love hot chocolate and french vanilla coffee. Nothing beats a big mug of hot chocolate with marshmallows! White chocolate mocha, hands down! Peppermint mocha! Thanks for offering the chance to win. I love hot chocolate. Thanks for the chance to enter. I JUST MADE THE NUTELLA HOT CHOCOLATE BY FAR IS THE BEST I HAVE EVER HAD. My favorite is just a good ol cup of hot cocoa.......ciao4now64 at yahoo dot com. Hot Chocolate Mints (add a little Peppermint Schnapps). Great on a cold night. Thanks for the opportunity! 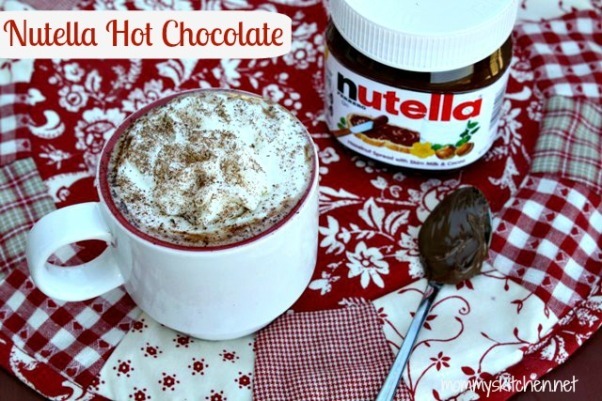 I love mint hot chocolate and the nutella recipe looks good as well. I really like hot chocolate! Marshmallows add a really nice touch, too! I love mint hot chocolate. It just rained here in TX and the girls went outside and they came in asking for hot chocolate even though it is over 80 degrees here. The nutella sounds really good! Give me some hot apple cider with a dab of real butter and a cinnamon stick. My favorite hot beverage is a nice cup of hot Mocha Latte! My favorite hot beverage is hot chocolate with marshmallows. My favorite hot drink is caramel apple spice. We used to always get it at Starbucks but found a recipe online and make it at home for a lot less money! Thank you for a chance to win. I love love hot mint herbal tea. Hot chocolate that is heavy on dark chocolate and mini marshmallows. Anything Nutella has to be good! A recipe my mother gave me called Russian Tea mix. It's a blend of Tang, instant tea mix, and some spices. Love it. It's a tie between Hot Caramel Apple Cider and Butterscotch Hot Chocolate! I love to curl up under a warm blanket in front of a lit fireplace with a steaming hot cup of Hot Chocolate w/marshmallows or whipped cream. My favorite is the Hot Chocolate with Marshmallows. I love all things warm in the cooler temps, but if I had to pick just one thing, it would be hot spiced chai. I love Russian Tea. But I have the feeling that the nutella hot chocolate might change my mind. I love hot chocolate with mini-marshmallows! All this talk of hot chocolate makes me excited for fall. I'm a summer girl, but a warm cup of hot cocoa or coffee always makes those cold days better. My favorite hot beverage is hot chocolate - specifically Salted Caramel Hot Chocolate from Starbucks! Has to be coffee! Seasonal flavored creamers based on mood and weather...pumpkin spice, mint chocolate, butter pecan! !